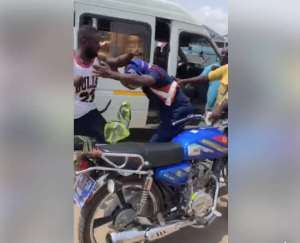 The commercial bus driver and his mate (conductor) who assaulted a police officer at Weija, a suburb of Accra, have been slapped with four counts of assaulting a police officer and causing road obstruction. Francis Buabeng, 26 and Albert Ansah, 33, have also been charged with conspiracy to commit crime and causing unlawful damage when they attacked the officer last week. It added that the two also unlawfully assaulted Constable Julius Mawuli Ekpe, a public officer while in the execution of his lawful duties at Mallam Junction. On the charge of causing unlawful damage, Francis and Albert have been accused of intentionally and unlawfully causing damage to a police uniform, a property of the Ghana Police Service. The final charge is that the two also caused obstruction and insecurity to other road users. The two were arraigned before the Weija District Court on Monday where they pleaded not guilty to the charges levelled against them. Francis and Albert while driving their bus and looking for passengers at the Weija junction reportedly stopped in the middle of the road to wait for some commuters. The driver’s action was said to have caused heavy traffic on the road, causing a motorbike to run into the rear of a private vehicle. Constable Ekpe, who was around the area, upon noticing the development, went there to help. But the driver is said to have almost knocked the officer with his vehicle when he ignored the officer’s command to stop and sped off. The police officer then hopped unto a motorbike, chased and crossed the driver causing him to stop. He then requested that the driver and his mate accompany him to the station. Other reports from witnesses also suggest that the officer was the first to attack the driver and his mate and that they only retaliated.